Frozen may be a favorite among the peewee crowd, but that word means something all too sinister to us gardeners. Now is the time to prepare against the Ice Princess’ powers. And don’t worry; you won’t need any magical trolls to save your plants, though some helpful elves and a little luck would be nice. First of all, not everything in your garden will need extra protection for a light or short-lived freeze. If you take good care of your garden through the year, your plants will fair much better when truly stressed by falling temperatures. Fertilize regularly in the growing season, water regularly and keep pests and diseases in check to make sure your plants can withstand wintery weather. Simply applying a good layer of mulch and watering well the night/day before expected freezing temperatures might be enough to get your plants through a drop on the thermometer. This is especially true if the freezing temps are not very low (below the mid 20’s) or don’t last very long. Even if some of your plants freeze to the ground, they may come back from the roots just fine (hibiscus, passionflower vine, elephant ears, hamelia, gingers, oleanders, philodendron, fig trees, many tropicals etc often do this). After a freeze, if plant parts are mushy, cut them off. If you can tell where they are frozen, but they aren’t mushy, leave them until the threat of freezing temps is over. The dead plant material will provide a little protection to the plant if another freeze occurs. If your plants do die back to the ground, be patient. They might possibly come back from the roots. Give them through mid spring (or as long as you can stand it) before you decide they aren’t ever coming back. When temperatures drop below the mid twenties for extended periods of time, protecting your tender landscape plants is important. 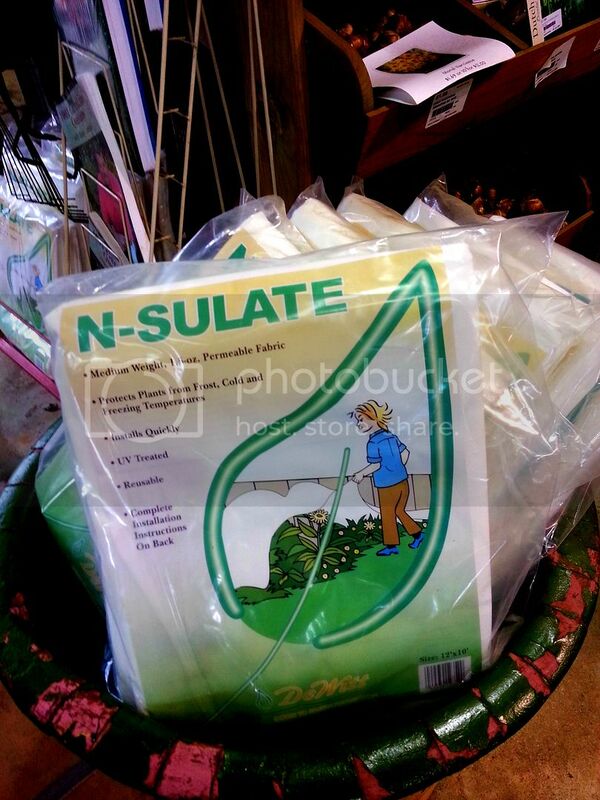 To help you with that, we carry a frost protection blanket called N-SULATE at Maas Nursery. This product raises the temperature beneath the blanket 6 to 8 degrees. And, it’s permeable, so your plants won’t suffocate beneath it. These frost protection blankets are 10′ by 12′, so they are a decent size to cover bedding plants and shrubs. N-SULATE blankets should be draped over plants and securely anchored to the ground like tents with garden pegs (we carry those too). And, N-SULATE blankets look a lot better than emptying your linen closet onto your front yard. Every year, I see my neighbors throw their sheets, towels and blankets out in their front yard to protect their landscape plants. Besides this looking like an ill-fated quilting party, many blankets are too heavy and sheets are too thin to really protect plants. It really is worth spending a little money to protect those plants that really need protecting, and don’t forget, that’s probably not everything that’s growing in your yard. So, what needs protecting? Well, gosh, I do wish I had a crystal ball and I could tell you for certain what you need to protect with every freeze. But, in gardening and in life, we deal with probabilities and possibilities and it’s often like gambling. Hedge your bets and do a little research on the specific varieties of your landscape plants before you decide how to tackle impending frost. Chances are, if your landscape plants are the same as all of your neighbor’s plants, they are probably well suited for handling a typical freeze (a few hours of mid to upper 20’s over night) for our area. Some of these common landscape plants are: nandina, Asiatic jasmine, indian hawthorn, boxwood, loropetalum, cleyra, pittosporum, gardenia, abelia, camellia (these actually love cold weather), photinia, bottlebrush, barberry, hydrangea, viburnum, holly, southern wax myrtle, euonymus, rosemary, pineapple guava, pyracantha, penstemon, arborvitae, privet, oleander and sage. Hmmmm. But, you have to remember handling a freeze means the plants may actually have some damage or die back to the ground, but will return in the spring. Also, the age and health of the plants will make a difference in their survival too. Sometimes I think we forget that plants don’t live forever – they have lifespans too. Just because it doesn’t croak one year, doesn’t mean it won’t the next. It’s a gamble and you just have to decide how much effort or $ you want to put into it. Please note that information provided here is in no way complete. I just don’t have time to expand on every single plant variety. Also, there are microclimates all over our area. What survives in one spot, may not survive in another. And gosh, that silly Ice Princess likes to play tricks. Extreme cold snaps that happen over a short period of time can wreak havoc on even the hardiest of plants. So, what’s the probability of losing a plant to freezing temperatures? Well, that’s a gambler’s question. And if you are a gardener in Zone 9, you are a gambler by nature. Lastly, a note about palms – Many palms are considered to be cold hardy here – Sabal Palm, Texas Palmetto, California Fan, Mexican Fan, True Date Palm, Needle Palm, Dwarf Palmetto, Saw Palmetto, Windmill Palm and Pindo Palm are more cold hardy than many other palm varieties grown in our area. You might see some very large palms that are not on this list (many do grow very quickly) and think that they would be foolproof choices for your landscape. Nothing is guaranteed and growing tropical palms in the subtropics really is a gamble. Sometimes, the risk is worth it, but every gambler, um, gardener has to make that choice. Well, as always, give us a call if you have any questions. We are always happy to help. “May the odds be ever in your favor” and may the Ice Princess stay in Arendelle.